Fashion house Karmik will open a franchise store in Pakistan at Lahore by end of August. As a part of the master-franchise deal with Lahore-based fashion retailer Arshadsons, Karmik plans to open six stores in cities such as Lahore, Karachi, and Islamabad over the next three years, followed by smaller towns. Estimated investment for the deal is around 3 million dollars over three years. The franchise agreement was signed in Delhi between Pradeep Hirani (CMD, Karmik) and Sheikh Aftab Arshad, Asad Amin Sheikh, Asif Amin Sheikh of Arshadsons. Arshadsons is into retail franchise business since 2010 and has a master franchise for Pakistan from Quiz UK and Moda in Pelle, being in leather trade and several other businesses since 1947. 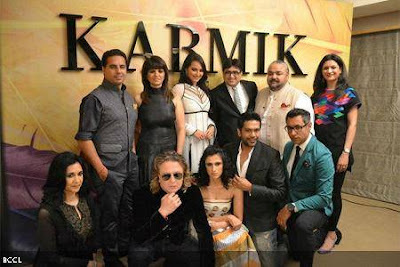 Karmik is a designer-wear fashion house which was launched at Lakme Fashion Week last year by its parent company Kimaya Fashions. It currently has 10 stores in Delhi, Mumbai, Bangalore, Ludhiana, Chandigarh, Chennai, Amritsar, and Jaipur. With 12 more stores in the immediate pipeline, Karmik plans to open 60 points of sales by 2015.